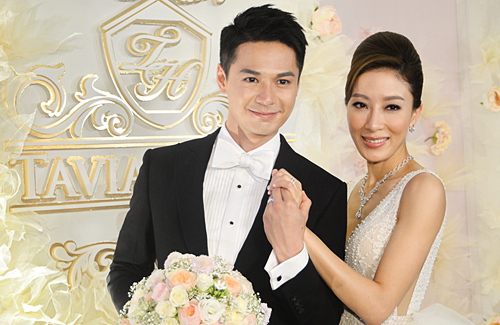 Portraying a villainous power couple with Roger Kwok (郭晉安) in TVB drama Another Era <再創世紀>, Tavia Yeung (楊怡) feels that she would not cut it as a strong-willed businesswoman in real life as she does not have the forcefulness nor sharp wits required. The 39-year-old actress, who left TVB in 2016 and got married with Him Law (羅仲謙) shortly after, shares that in real life, she seems to have taken on the role of a part-time plumber and repairman after marriage. Very good philosophy from Tavia. I like this couple a lot. They seem to be managing their marriage very well. I love how Tavia is so real she doesnt try to come off as all perfect and everything which is totally normal no one is perfect. She’s a great actress along with her great personality and now she has her married happy life. I wish she would do more villain roles because somehow I’m way more interested in the villains than the perfects leads. I loved her in beyond the realm of conscience she carried that show! Loved Tavia. And fully agreed that she & Him seem like a nice couple. She is real & came across as a very practical person.